Canadian academic Michael Ignatieff is rector of Central European University, which is still awaiting certification by the Hungarian government of Prime Minister Viktor Orban, a loud critic of CEU's patron, financier George Soros. Michael Ignatieff, the rector of the George Soros-founded Central European University in Hungary, is saying “enough is enough” in the university’s wait for certification from the right-wing government of Prime Minister Viktor Orban. Mr. Ignatieff has given the government, which has refused high-level meetings to work on the issue, a deadline of Dec. 1 to come to the table, or the university will shift its U.S.-accredited courses across the border to Vienna. Within months of Mr. Ignatieff’s appointment to head the university in September, 2016, there were rumours that Mr. Orban, a right-wing nationalist, was planning to target CEU. Hungary’s top-ranked university, CEU was founded in 1991 as the country moved to democratize in the aftermath of communism. Founded on the ethos of open society, the university has offered postgraduate courses in such subjects as political science, nationalism and gender studies ever since. Most of its graduates, who study in English, receive degrees both from Hungary and the United States, thanks to its dual accreditation. 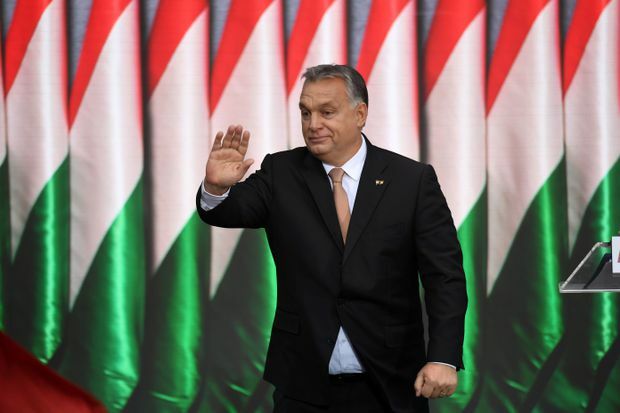 However, since regaining power in 2010, members of the Orban government – several of whom graduated from CEU – began to espouse “illiberal” values, and, in December, 2016, Mr. Orban declared 2017 as the year of “de-Sorosization.” In March, 2017, the government unveiled the “lex CEU,” legislation which cast doubt on the university’s future in Hungary and sparked some 80,000 protesters to take to the streets calling for academic freedom. Demonstrators hold posters in Budapest as they protest against the efforts to close Central European University on April 9, 2017. The new law requires foreign universities to conduct educational programs in their countries of origin. A second, more difficult, stipulation means that CEU – originally accredited in the United States – must have an intergovernmental agreement between Hungary and the relevant U.S. state. CEU moved to meet the demands, setting up facilities at Bard College in New York and drafting an agreement that would settle the issue, something the Orban government has now done with Budapest’s two other U.S.-accredited colleges. But CEU’s draft agreement has gone unsigned for more than a year now. All the while, Mr. Ignatieff has not been granted a government-level meeting. This state of limbo has not significantly hit application numbers and Mr. Ignatieff and his board of trustees last summer restated their commitment to keep all operations in Budapest. While CEU has been waiting, however, the Orban government has cast the university’s founder as the country’s main threat, vilifying the liberal, Hungarian-born U.S. philanthropist and financier as part of a “Stop Soros”-themed election campaign, which accused him of funding a “Soros Plan” to increase migration to Europe and erase national identities. Ironically, Mr. Soros funded Mr. Orban’s studies at Oxford University in the late 1980s. At a Budapest subway stop, Hungarian government posters portray financier George Soros and say 'Don't let George Soros have the last laugh,' on July 11, 2017. Some, meanwhile, drew hope from the arrival of a new U.S. ambassador, David Cornstein, a Trump-appointed businessman. The ambassador quickly proclaimed CEU’s staying in Budapest a red line for the United States. But his repeated misstatement of the institution’s name – “I have spent more time on Central University than on any other subject,” he told students in a speech at CEU in October – saw many at the university question his ability to strike a deal. The Globe spoke with Mr. Ignatieff as he faces the prospect of overseeing arguably the first politically motivated rout of a university from a European country since the Second World War. People attend a rally outside CEU in Budapest to protest against the university being forced out of the Hungarian capital, on Oct. 26, 2018. How has this drawn-out standoff affected CEU? It’s frustrating because we have made a good-faith effort to find a way to stay in Hungary as an American institution. We’ve been here 25 years, we’ve done nothing wrong, they changed the rules of the game, we tried to comply. And everything – a barrage of misinformation – is simply falsehoods. So, we’ve said enough is enough, I’ve got a university to run. I’ve got to get students in classes for September, 2019; they’ve got know where they’re going to study, so we will issue our degrees in Vienna. How can a university realistically stand up to a government? I think it’s important – we are not without resources here, that is to say we’ve had great support from the United States, we’ve had important support from 500 universities around the world. The Canadian Association of University Teachers. It has been bipartisan. Republican senators, Republican congressmen. Academic freedom should never become a partisan issue and woe betide a country where it does. When was the last time this happened in Europe? I can’t think of an example where a supposedly democratic government in a European Union member state actually succeeded in forcing a university out, and I think – and I’ve said it for 17 months – it’s a scandal. These people are NATO [North Atlantic Treaty Organization] allies of Canada. It’s not as if this is happening on Mars. It’s happening in a European state and a NATO ally, and they appear to be pursuing an agenda that doesn’t listen to the United States, doesn’t listen to Europe. Canada has made representations, for which we are very grateful. How do we classify your announcement that CEU will decamp to Vienna if it doesn’t secure an agreement by Dec. 1? Is it an ultimatum? No … universities can’t send ultimatums to anyone. Someone wrote in the right-wing Hungarian press that I “put a gun to the government’s head but it didn’t have a bullet in it.” Come on, I don’t have any guns, I don’t have any bullets, I’ve got nothing. So that’s ridiculous. What we’ve said is that we’ve been at this since March, 2017 – 17 months. A university cannot function without a rule-of-law framework. If we can’t get a rule-of-law framework then we can’t stay, period. It’s not an ultimatum, it’s just us saying we can’t go on like this. Hungarian Prime Minister Viktor Orban speaks in front of Budapest's Terror Haza (Museum of Terror) at an event commemorating the 62nd anniversary of the Hungarian uprising against Soviet occupation on Oct. 23, 2018. What would an agreement mean from an Orban government, when the law could change the next day anyway? That is true. But look, our heart and soul are here, I use these words advisedly. We don’t want to leave. I realize there are risks with a deal with the Hungarian government, but we have tried conscientiously to get one for 17 months and I’m not changing my tune now. What has been the highest-level discussion you have had in those 17 months? I’ve had no discussion with the Hungarian government since late March, 2017. None. Zero. And at every point we have been willing to have discussions. … There’s no meeting currently scheduled, but we want one. We need one. What happened when Mr. Cornstein met with the government? He met Mr. Orban on Sept. 10 and CEU was a prominent part of that discussion. … So, there are discussions with the U.S. ambassador and senior members of Mr. Orban’s entourage and we hope they’ll continue and hope they’ll yield a result. What is your response to Mr. Orban saying “what agreement?” when asked recently about the CEU deal on the table? How do you respond to that? After 17 months, I am speechless. Have there been any specific threats? It’s a very fraught situation but, you know, I hope Canadians understand that it’s not a threatening situation, it’s a policies one. … I walk to work every day, we love the city, I like being here, it’s a good place. … We know we have support in the city of Budapest. We know we have support in the country, from some of our colleagues in other institutions. It doesn’t feel scary or threatening in the least, it’s just frustrating. CEU's campus in Budapest. The university is working on a rental agreement for a new building in Vienna if the certification issues in Hungary are not resolved. Have you costed the Vienna move? It’s expensive and one of the things that is slightly difficult about my life is that it’s a little difficult to estimate how expensive. … But we’ve got the resources. If we’re smart and can manage our resources carefully, we’ll be fine. We are just in the final stages of concluding a rental agreement for a kind of former bank building. What’s the mood here, what are the students saying to you? Let’s change it from “students” to “student.” A student in political science. She said there were demonstrations outside last Friday. She said she was uncomfortable with the way that political parties in Hungary have begun to mobilize on this issue. … She feels very strongly that she doesn’t want this thing exploited by local political actors, and I’d have to say I agree with her. There’s nothing I can do about what happens outside the building here. We will never organize political demonstrations. I have had no contact with opposition politicians here in the two years I’ve been in the job, and by no contact I mean no contact. … I’m just saying that a university has to make sure it fights its own battles and doesn’t get drawn into other peoples’ agendas. What will remain here in Budapest? I hope we maintain a continuous presence in Budapest. But here’s my frustration: The government. … Suppose they insist we cannot issue U.S. degrees; then we maintain Hungarian accreditation. Hungarian accreditation allows us to do certain things but we don’t know what. My view is that if the Hungarian government thinks they can just get rid of us, they’ve got another think coming because we are legally allowed to be here as a Hungarian institution. We can continue in some fashion and buildings will stay open and we will continue to do what we’re doing. You’re a historian. There seems to be a struggle between democratic and anti-democratic forces developing all over the world. Is the university on the fault line of some seismic geopolitical shift? That’s pretty dramatic language. I’d put it slightly differently for a Canadian audience. I think something very important is being played out here: That is, what kind of democracy we are going to have in Europe and possibly North America in the next 20 years. This regime has led the way with a single-party state and this could be the future of not just Hungary but a lot of countries. So, what’s happening here is important, and this little university, without overdramatizing, has been at the centre, because if you don’t have free universities you don’t actually have a democracy. … Academic freedom is not a luxury for professors, it’s a key indicator of what kind of democracy you have and whether you have one at all. What’s happening here is: “Wake up, take a look, pay attention." It’s simple. What if we could have our cake – and our character, too?